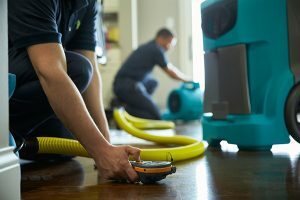 Water damage can be caused by so many different things, making it difficult for residential and commercial properties to avoid suffering such damage. Rain, humidity, flooding, and other weather conditions commonly cause water damage. Internal property issues, such as leaky appliances or fixtures and pipes bursts, can happen at any time, and these problems will cause water damage to your home or property as well. The excess water involved in these situations is concerning, because it will spread and cause the damage to worsen. As water spreads throughout your property, the damage becomes a bigger problem. Porous structural materials will absorb the excess water and become damaged. The materials may become discolored and swell up, causing structural damage to your property and increasing the risk of mold growth. 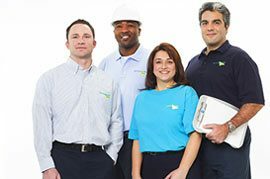 Serving Bergen County, NJ, ServiceMaster Restoration by Complete provides homes and businesses with complete water damage restoration services. Within 1 to 2 hours of your call, our technicians will arrive to your property to start our services. We will contain the water to limit the damage, and we will develop an effective restoration plan to thoroughly restore your home or business. No matter the amount of water in your residential or commercial property, it should be treated immediately because of the damage that it can cause. The more time that the water has to be absorbed by porous building materials, the more structural damage it will cause. Additionally, the water provides the perfect conditions for mold growth in the affected materials, which worsens the damage. If mold grows, then it will also present health concerns to anyone exposed to the fungus. ServiceMaster Restoration by Complete is ready to address any case of water damage, using the best available water extraction and drying equipment to eliminate excess water and moisture. After the water extraction, our technicians will completely dry all damaged areas and restore or repair the damage. Emergency Response: Within 1 to 2 hours of your phone call, our technicians will arrive to your property to contain the water damage and conduct a complete evaluation. Water Extraction and Drying: Using our water extraction equipment, we will remove any standing water from your property. We will also remove excess moisture from damaged materials by setting up our dehumidifiers. Reinstallation and Cleaning: Our technicians will clean up and restore the damaged areas following the water removal process. Any furniture and other large objects that have been moved to perform our services will be moved back. Remove excess water by mopping or blotting it dry. Remove non-permanent flooring and floor coverings, like rugs, but leave any carpeting and permanent flooring alone to be dealt with by professionals. Use a clothes/coat hanger to keep any drapes off the floor. Place the bottom of the drapes on the hanger and hang the hanger up on the rod. Place aluminum foil beneath furniture legs and wipe off any water on the furniture. Store photos and other vulnerable belongings in a safe place. Any water-damaged books should be packed together tightly on a shelf. This will prevent the pages from warping until proper drying can be conducted. Speed up the drying process by opening all of the doors in your property. Do not go into a flooded remove unless the power has been shut off. Do not remove standing water with a standard vacuum cleaner. Do not remove any carpeting or flooring that is permanent. Do not use any electronic appliance until it has been deemed safe to do so. Do not try cleaning any mold growth or mildew on your own. If you notice that your home or business has suffered water damage, then you need to act immediately to prevent further damage and potential mold growth. You can call (732) 840-3570 at any time of the day to reach ServiceMaster Restoration by Complete for the water damage restoration services we provide in Bergen County, NJ. We will be quick with our response to restore your property in an efficient manner.